A valuable contribution an individual can make to WordPress development is to test WordPress, even if you are not a developer. Before every stable release of WordPress, pre-release versions are made available for testing. You can download the pre-releases and test them, so that the WordPress developers can fix problems before the new version is made available to the public. If you want to be on the bleeding edge of development, even before pre-release versions are put together, you can also check out the latest software from the WordPress Subversion (SVN) repository. Or, you can get the “nightly build” (which is created from the Subversion repository) — almost as up-to-date as the instantaneous Subversion repository. To get started, install the WordPress Beta Tester plugin. Visit Plugins > Add New, type “wordpress beta tester” in the search field, and then click/tap “Install Now”. Backing up first is sensible. Select the “Bleeding edge nightlies” option to follow development for the next major release of WordPress, or “Point release nightlies” to follow development of the next point release. Point release nightlies. The current release is 5.0.0. Selecting this will put you on the track for 5.0.x development. Bleeding edge nightlies. Selecting this will put you on the track for 5.1 development. If you find bugs while testing pre-release or already-released versions of WordPress, see Reporting Bugs or post in the Alpha/Beta support forum. New features are often developed as plugins. Feature plugins can be installed from the beta testing tab on the plugin install screen of your WordPress dashboard. Navigate to Plugins > Add New > Beta Testing. 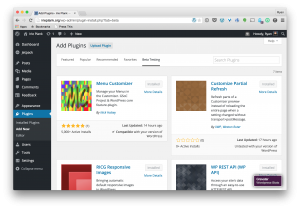 The plugins listed here are proposed for future versions of WordPress. They are glimpses of the future that are under active development. New versions are released regularly, sometimes daily. Some feature plugins require that you follow bleeding edge nightlies. make/core is the main WordPress development blog. It is active and will keep you up-to-date on what’s happening right now in WordPress development. make/flow contains visual records and visual bug reports from the Flow Patrol team. The Flow Patrol handbook includes information on triage if you want to get into triaging posts on make/flow. When done testing, rolling your site back to the latest stable production release can be done with a tap/click of “Re-install Now ” on the Dashboard > Updates screen.